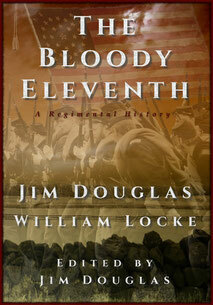 I'm pleased to announce today that my new book, The Bloody Eleventh: A Regimental History has been released by Plum Run Press. It's now available on Amazon. The Kindle version has also been released. It contains everything in the print version plus a bonus section with additional pictures and color maps, and also a bonus chapter from my first book, Born To Serve: The Major A. G. Happer Story. I'm really excited about this new companion book to Born To Serve as it contains the pictures and maps that my editors cut from that book, plus more. There are over 80 Civil War pictures and 30 maps! Now the reader can read the story while viewing a picture of what the area looked like when the men of the Eleventh were there! The maps really help visualize the "big picture." There were a very few places that there simply are no suitable period pictures available, but almost all areas are covered. This story goes farther than BTS, because Captain Happer was wounded at the Wilderness and taken prisoner. The regiment continued on. The Bloody Eleventh tells the complete history of the Eleventh Pennsylvania Infantry, as written by the Regimental Chaplain, the Reverend William H. Locke. I've added my two cents worth throughout and all the pictures and maps adding some context and some of the wider view where appropriate, without messing up Locke's excellent narrative. From the beginning of the war, the story continues on with what happened during the rest of the conflict. One of the hardest fighting regiments in the Army of the Potomac, the Eleventh went on to fight in all the battles from Spotsylvania, Cold Harbor, Hatcher's Run, Weldon Railroad, Petersburg and more, through Five Forks and on to the surrender at Appomattox. This book isn't all battle details either, it is loaded with human interest stories and asides, some amusing, some not so much. So, once again fall in with The Bloody Eleventh as we take to the campaign trail and find out what it's like to be in an infantry regiment during the Civil War. I hope you all enjoy reading it as much as I did writing and bringing it all together. Thanks to all the good folks at Plum Run Press for making this possible.